The French intensive garden, also known as double-dug raised beds, is the most productive, sustainable method of gardening on the planet. While the French get credit, it has been around for a very long time, as the Chinese have been gardening in deeply cultivated raised beds for millenia - with no loss of fertility. By loosening the soil very deeply (20-24”) and incorporating a lot of compost, the soil gets fluffed up and raised above its surroundings by a foot or more. This fluffy, loose, deep and friable soil now allows plant roots to grow straight down, rather than going down a few inches, hitting a hardpan, and turning sideways where they compete with each other for water and nutrients. Hardpan is a compacted layer of soil (a bit like concrete!) that is actually created by rototiling or walking on the soil. It's counter-intuitive, but just below the depth of the tines on the rototiller, your weight and the weight of the machine are compacting the soil. It's easier for plant roots to turn sideways than penetrate the hardpan. I use the French intensive gardening method because it is cheap, sustainable, preserves natural soil ecology, and produces the world's healthiest vegetables. 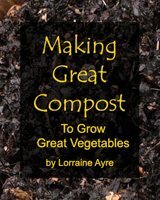 Uses less water, compost and fertilizer than any other method of gardening. Uses less space per given yield than any other method of gardening. Very easy weeding. Because the soil is loose and friable, weeds are at a disadvantage, and can be easily pulled up by their roots. Works to benefit natural soil ecology, which in turn benefits us though more vitamin and mineral-rich vegetables. Inexpensive. You do not need to purchase anything such as commercial potting soil, lumber or other building materials, or a rototiller. It uses no gasoline. Because of the depth of the soil bed, plants can be grown closer together than any other method, creating a "living mulch" that retains nutrients and water. By the second year, the double-dug raised bed technique takes much less labor, because soil ecology is optimized and earthworms and other soil organisms do much of the work for you. Open the box, assemble, fill with soil, and you have the easiest raised bed garden ever. The best kits for premade corners. Just buy lumber and you're good to grow! Construction tips that go along with the raised bed garden gallery.